Friday's papers feature articles on the Green Party chair's sick leave, declining hourly wages in the public sector and the male-only Bourse Club's future. On Friday morning, many Finnish papers discuss Touko Aalto’s sick leave. The chair of the Green Party announced on Thursday that he would take a break from his duties due to fatigue. “I’m exhausted and understand that I’ve reached the limit of what I can do. None of us can be stretched endlessly and nobody should risk their health because of work – including politicians,” Aalto wrote on Facebook. Daily Helsingin Sanomat says the popularity of the Green Party has steadily fallen since summer of 2017 when Aalto was elected to lead the party. 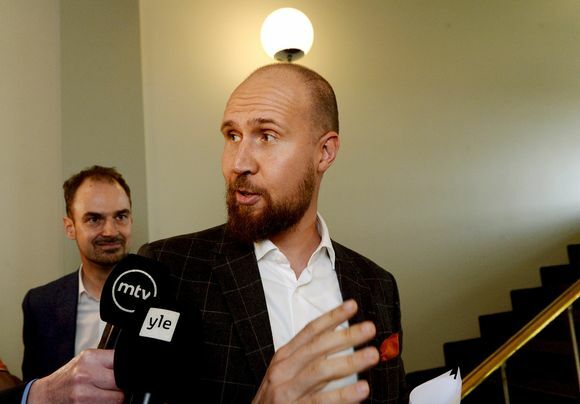 While other leading politicians in the party have given their support to Aalto for a long period of time, critical voices have surfaced more recently, HS says, in particular following his public behaviour. Last month, a bare-chested Aalto was photographed at a nightclub Pride event in Stockholm, where he appeared to be playfully slapping another man’s posterior. Former Green party chair Ville Niinistö said last week that "a good politician puts more focus on the ideas, values and causes he works for, and less on himself." According to HS, the three deputy chairs of the party will step in to replace Aalto during his indefinite sick leave. Daily Turun Sanomat says politics may have become more stressful, due in part to the rise of the social media. Citing Jenni Karimäki, a politics researcher at Turku University, TS says leading politicians are expected to be available 24/7 and ready to comment on any matter at a short notice. "Because Aalto is a first-term MP, he doesn’t benefit from a long career in national politics. That must put pressure on him and increase his workload," Karimäki adds. Tabloid Ilta-Sanomat reports that hourly wages in the public sector (state and municipalities) have fallen for the first time in 20 years. IS says the government’s competitiveness pact signed in 2016 increased working hours in the public sector by 30 minutes per week, which has now caused a drop in hourly wages by between 1.3 and 1.5 percent. Last year, average wages for workers in the public sector was 18.3 euros per hour, down from 18.4 euros in 2016. According to Sampo Pehkonen from Statistics Finland, such a wholesale drop in salaries is rare. However, monthly salaries have not fallen. In the private sector, the average weekly working hours in 2017 grew from the previous year as well, meaning that hourly wages declined slightly, Pehkonen adds. In other news, tabloid Iltalehti reports that the men-only Bourse Club (Pörssiklubi in Finnish) may finally open its doors to women. The board of the Helsinki club, which has offered a place for gentlemen to discuss their investments since 1910, has proposed a change to its rules. Until now, the club has only admitted men, and the proposed change is driven by financial concerns, Iltalehti says. In recent times, 20 members have left the club, with no new applications coming in. According to a survey by the Bourse Club, slightly over a half of its members support female membership. However, for the rule change to become valid, it must be supported by two-thirds of the membership. Iltalehti says some members are concerned that there will no longer be an opportunity to "spend time with the boys". Last year, members voted to maintain the males-only rule, which prompted the club’s landlord to review the terms of its tenancy. In January, Pertti Korhonen, the chair of mobile operator DNA, quit the club citing misogyny.